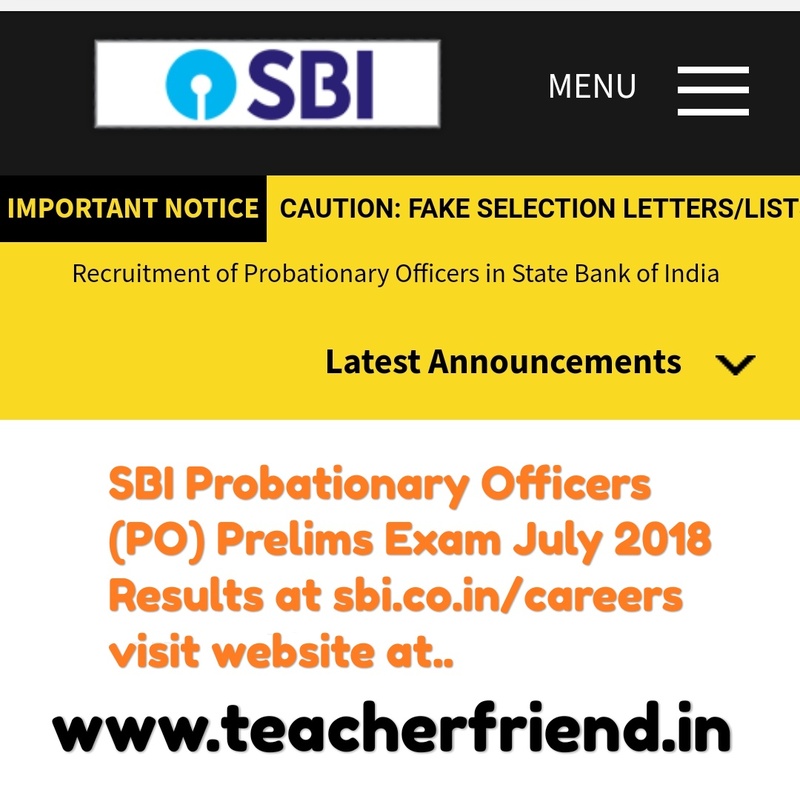 SBI Recruitment of Probationary Officers (PO) Prelims 2018 Results scores Card Download at sbi.co.in/careers/Recruitment of Probationary Officers in State Bank of India SBI POs PRELIMINARY EXAMINATION HELD IN JULY 2018 Results and Marks Secured Cards Download at https://www.sbi.co.in/careers/SBI POs July 2018 Preliminary Exam Results Score Card Download at www.sbi.co.in/careers/SBI Probationary Officers (PO) Prelims Exam July 2018 Results at sbi.co.in/careers. Probationary Officers in State Bank of India Result of the Written test (Phase - I) Held in July 2018. Registration Numbers of Candidates Shortlisted for Phase - II(Mains Examination on 4th August 2018. The State Bank of India (SBI) has released the result of Probationary Officer (PO) preliminary examination. Candidates can check their scores on its official website, sbi.co.in and bank sbi/careers. SBI announces Probationary Officer (PO) Prelims 2018 exam result Who are Appearing Candidates are wait for the Probationary Officer (PO) prelims exam result is over as the country's largest bank, State Bank of India (SBI) has declared the Probationary Officer (PO) Prelims exam results on its official website https://www.sbi.co.in/careers/. State Bank of India SBI has released the list Succes full Candidates roll numbers selected for the mains exam. SBI had conducted the PO preliminary exam on July 1st 2018 and 7th and 8th July 2018 which nearly 10 lakh candidates had appeared. The bank plans to hire 2,000 candidates for the post of Probationary Officers. SBI PO recruitment Phase - II (Mains Examination) will be held on 04/08/2018. See announcement section on the website. Locate the Recruitment of Probationary Officers tab on the page Click here to check SBI PO Prelims Results. The exam will be an online objective type and descriptive test of 200 and 50 marks each. Reasoning and Computer Aptitude: 45 questions (60 minutes). Data Analysis and Interpretation: 35 questions (45 minutes). General/ Economy/ Banking Awareness: 40 questions (35 minutes). English Language: 35 questions (40 minutes). The descriptive test will be of 30 minutes duration with two questions for 50 marks. It will be a test of English language (letter writing and essay). The results for the mains will be declared on 20 August, The group exercises and the interview will be conducted from 24 September to 12th October 2018. The call letters for the same will be released on 1st September 2018 according to reports. The final results will be announced on 1st November 2018. The bank has also warned against fake website and fraud offer letters. "It has been reported to us that some fraudsters have hosted websites making them appear to be as those of State Bank of India (SBI). Fake lists of selection for posts in SBI have been published on these websites, and reportedly fake appointment letters are also being issued in the name of SBI," a notice on the bank's website read. All details regarding recruitment like notice, interview schedule, final result etc., are published only on visit official website at sbi.co.in/careers and bank.sbi.careers,"
Get Download SBI POs July 2018 Preliminary Exam Results Click Here.